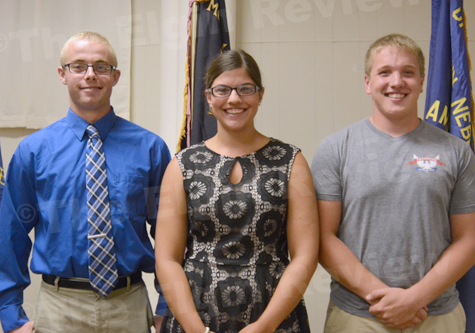 Jenna Landgren spoke at the annual Elgin Veteran’s Club steak fry held at the KC Hall. Hers was just one of several presentations made during the evening. Landgren currently serves as a public health nurse and VetSET Coordinator at the North Central Health Department in O’Neill and is also contracted with Loup Basin Public Health Department in Burwell. For the next two years she is working on a pilot program to help service out veterans, service members (mainly post 9/11, but others as well), and their families called VetSET Nebraska. The health departments are contracted with Nebraska Association of Local Health Directors (NALHD) to do the pilot program. Nebraska is only one of five states that was granted this money by the Office of Rural Health out of Washing-ton D.C. to do the program. 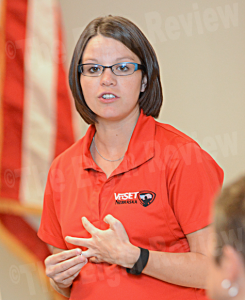 VeTSET focuses on rural and /or underserved areas. Landgren said VetSET was initiated after studies showed our military personnel returning home from deployment are having increasing numbers of major de-pressive disorders, increasing rates of suicide; homelessness and unemployment rates are on the rise, the family dynamic has completely been upturned and changed. If they have children, their child’s school performance may be poor following the deployment or they may be acting out and having behavioral issues during deployment or from moving around. She said North Central and Loup Basin are working together within the local communities in rural Nebraska to build partnerships that will help identify where the needs are for our veterans, service members, and their families. “We are partnering with groups and programs already established locally to bring all the resources together in one place on our ‘Network of Care’ website,” she said. One goal is to help educate and increase military culture in our communities and better prepare community-based providers to serve veterans, service members and families. “We are assisting our service members returning home so they are successful as they reintegrate back into their families and communities,” she said. Information is available on health care, mental health, substance abuse programs, education, financial/housing assistance, transportation, em-ployment and family support/marital counseling. Veterans, service members, and their families are encouraged to fill out a VetSET Screening Tool to help identify where some of our gaps are barriers are. They can be accessed online by going to the North Central District Health Department’s webpage (www.ncdhd.ne.gov) under services and going to the VetSET page. Part of increasing the military culture is putting on “No Wrong Door” trainings across the state. VetSET has partnered with The Brain Injury Association of Nebraska to put these trainings on. Also making brief presentations at the gathering were local students who attended Boys/Girls State. Katie Polk, Austin Meis and Alois Warner all shared their experiences and answered questions. Each thanked everyone for sending them to the week-long event held on the campus of the University of Nebraska-Lincoln. 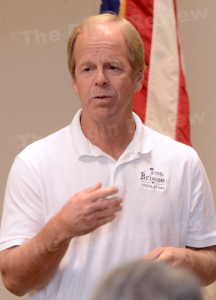 Also present to “meet and greet” was Tom Briese of Albion, who is seeking the position of District #41 State Senator which will, due to term limits, be vacated in 2016 by Kate Sullivan of Cedar Rapids. Briese spoke briefly about his back-ground, then took questions from the audience about his decision to run for public office. At the present time, Briese is the only person who has filed as a candidate in District #41. Nebraska Boys and Girls Staters for the 2015 year, l-r: Austin Meis, Kaitlyn Polk and Alois Warner. Not present: Whitney Walker Moore.